Welcome. Welcome back to the show friends. I’m so happy that you’re here. 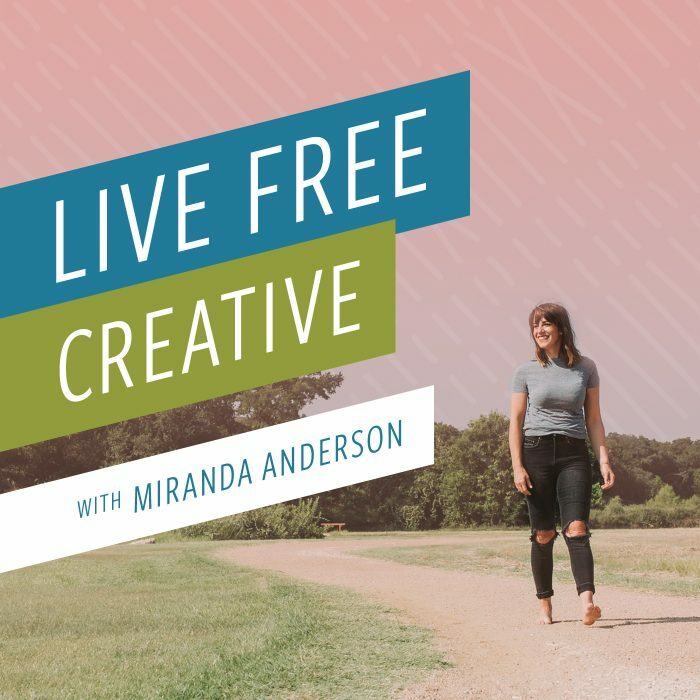 I’m Miranda Anderson and this is episode 31 of Live Free Creative, Making The Most Of Events. Now, this episode is especially poignant for me and my life right now because I am in the middle of what I call “conference season”. This is the springtime when the blogger events and conferences are happening all over the country. We’re right in the middle of South By Southwest right now in Austin. Of course, I’m not there, but thousands of people have flocked to Austin to make the most of what that event has to offer. I am headed to Alt Summit in a couple weeks and after that I’m going to SNAP conference. Last week I was at Thrive Blogger Conference and a little bit later on this spring I’m going to be at Mom 2.0 which is also an Austin. Lots of events happening in Austin which I will not complain about because that means I get to go eat my fill of Torchy’s queso which you all know is my favorite. Because there are so many fun events happening right now in my life. I thought that I would take some time today to share with you my four key tips for making the most of events. You don’t have to be a blogger going to conferences to appreciate this. These four tips will also serve you for events such as parties, book clubs, going to church events, activities that your friends plan or even vacations. Knowing how to prepare for in person and even online events can really be helpful to give you some framework, some perspective, and also give you some confidence as you head into whatever the events or vacations or things that you have coming up in your own life. Before I begin jumping into my tips, I want to share some peaks of the week with you. Now. These peaks of the week are all going to be travel themed because as I mentioned, I am doing a lot of traveling. In fact, a little bit later today I’m hopping on an airplane with my sisters and my mom to head to Portugal and Spain where we’re going to spend a week exploring the streets of Lisbon, Porto and Barcelona. And I’m so excited. I’m only home for a few days before I go to California and then to Salt Lake and then to Austin and it goes on and on and on for the next couple months. So I thought I would love to share some peaks of the week that have really added to my ability to travel. Wow. So here they are. My first travel themed peak of the week is a fanny pack. Now you guys, if you lived at all in the eighties or nineties you remember and you probably have seen that the fanny pack trend is coming back hard. I think they’re fun for around town and kind of cute and on trend, but they are so amazing for travel. I have been using my fanny pack, I have a little black fanny pack. Mine is freshly picked brand. It was given to me at the Alison’s Brand School last year and I love it so much. There’s a few other ones that I also really love and so I’m going to link a couple of my very favorite fanny packs in the show notes so that you can check those out. The reason that I loved them for travel is that it is truly hands free. They’ve been used for travel forever. Right, like the mom in the 80’s with a fresh perm and Birkenstocks and socks and like a tie dyed fanny pack. Yes. There is a reason that that woman had a fany pack filled with snacks and treats and hand sanitizer and money and maybe a disposable camera. When I travel, lately, I have been using my fanny pack to keep all of those essential items together on my person while still having my hands free to get on and off of trains to use my camera, which is often slung over my shoulder. I really love being able to tuck my passport in the back, have some cash on hand, but also have my whatever credit or debit card that I’m using for my travels. I put a pair of sunglasses. I like to get, keep a little snack, my chapstick and some hand sanitizer, maybe some tissues. It’s really just the best way to have everything right on me without taking up any of my shoulder or arm space, so I love a fanny pack. If you’re doing any traveling coming up for the spring break or the summertime, I recommend a fanny pack to make your life a little bit easier. Number two is new to me and I’m obsessed. It is the makeup wipe face washer cloth. I think that’s the official name, actually. The “makeup wipe face washer cloth” from The Beayouty Bureau. Kayti, one of my favorite online makeup babes. Kayti from The Beyouty Bureau, released a bunch of products last month and I spotted these makeup wipes there. I just got some in the mail and they’re bright pink, which is really cute, but they kind of feel like just like a soft blanket, like they feel like it should be like my lovely wife to take a nap with, but the word on the street was if I got it wet without any soap or anything, I could use this wipe to wash my face and it would take off all of my makeup including waterproof Mascara or anything else tricky and I have been using them and I love them. It’s so great for travel because I can bring this one tiny little washcloth and it serves as my soap in my face wipes and all of the things that I need for the end of every night to just get all of the travel, grime and makeup off of my face. You simply wash your face with it, just like wet it, wipe your face off, rinse it off in the water and then hang it to dry and it’s ready to go for the next day. So I will link those in the show notes. The third peak of the week travel tips is packing cubes. Raise your hand if you have seen packing cubes but you aren’t on board with them yet. I was in that boat for a long time. My mom has been raving about packing cubes for so long. If you don’t know what a packing cube is, it’s basically like a little tiny nylon bag with a zipper that has a mesh top and you use it to put your different types of clothes and underwear and toiletries and stuff to keep your bag organized when you’re packing. I had always kind of seen it as why would I add more stuff to my bag, like put my stuff inside of bags inside my suitcase. It feels like just more bags. Well, when we were getting ready for Germany, I decided we needed new carry ons because ours were like twenty years old and falling apart. Actually the handle came all the way off of mine, so I ordered new carry ons and these packing cubes on Amazon and I instantly fell in love with them. They seriously, they’re super duper lightweight, so contrary to what I believed, they don’t add any weight or any bulk to your suitcase itself, but they keep everything so nice and organized. I’ll link to the ones that I got, the ones that I got or just Amazon basics and so they were inexpensive. They came in two days. They are so wonderful. They have a bunch of different sizes. I now am just there, my favorite four, I divide all of my exercise clothes into one packing cube. I can put my swimsuit and socks into it. Another one I can put my toiletry bags into one. My jeans and pants go into one. My tops going to. When you get the picture, keep your suitcase super organized. It helps when you get to your location as well. When Dave and I were in Germany, I, we both had our packing cubes and we just pulled out the packing cubes and set them up on the desk. And so then it was like having a little mini dresser because all of my clothes were organized within these cubes and I wasn’t digging around shuffling through my suitcase the whole week. So these are my very favorite new packing tool and I’m excited to pack in them as soon as I finish recording this podcast episode for the flight that I’m getting on this evening, I have not packed yet so they will make my job a lot easier. So those are my three peaks of the week for this week. Travel inspired a fanny pack, the makeup cloth from the beauty bureau and the Amazon basics, packing cubes. All of them are linked in the show notes at livefreecreative.co/podcast check them out. Let me know what you think. Peaks of the week y’all. You might be able to tell I’m a little bit high energy this morning. I’m a little bit on one. I think that that is due to the fact that I have been a little bit sick for the last few days and I’m finally starting to feel better. I’ve been intending to record this podcast over and over every single day that has gone by. I thought, okay, I’m going to sit down and record the next episode and then I’ve been coughing or I have I been too tired. I haven’t felt well and it feels so good to finally feel good and the sun is shining today and the kids are at school. It just, it’s a beautiful day, so I’m happy to be here with you. I’m really excited to share this episode. So let’s dive into my four tips for getting the most out of events. To begin, I just want to give you a little bit of background. I have been attending events and hosting events for years. The first in person event that I went to for my job as a blogger was back in 2012 I went and taught a class at a conference that no longer exists called Sewing Summit. It was fun and overwhelming and exciting and a little bit nerve wracking to go meet a bunch of people that I had only known online and feel like I wanted to be friends with them and I wanted to be myself and I also wanted to meet some sponsors and I wanted to make connections and I also wanted to do a good job teaching my class. I felt so excited and also a little bit overwhelmed by all of the different things that would happen at this event. And you’ve heard me talk about Alt Summit before. I went for the first time in 2013 and feel like it really changed my life. Honestly, it was a pivotal time. A couple of the talks that I went to really change my perspective. They helped me make a couple of big decisions that I had been mulling over and I have attended all summit at least once a year, every year since I feel like most of my best friends that I have in blogging and my online community I have met or deepened my relationship with them through Alt Summit. I also have met some of my favorite business contacts and blog sponsors through attending Alt Summit. I’ve also attended SNAP conference and Thrive Blogger Conference and Mom 2.0 and some of these other conferences that you’ve heard me talk about. I think all of them are incredible and I really have a soft spot in my heart for Alt. It also so happens that I will be back at Alt Summit next week. It’s going to be in Palm Springs. It’s really fun. It’s really geared maybe away from only bloggers and now is a lot of small businesses and entrepreneurs and women designers and all sorts of different professionals go. It’s a really fun time and I’m super excited and looking at my calendar full of conferences and events coming up in the next couple months reminded me of these tips and I wanted to share them. So if you have anything coming up, whether it be a conference and activity, a vacation, a party, you feel like you are prepared to make the very most of whatever event is happening in your life. My first tip for making the most out of events is to be clear, be clear about what you want to get out of it. I like to set an intention when I’m getting prepared for an event. There are so many different purposes for for going to an event, something like a blogging conference, you could want to meet sponsors. You could want to meet colleagues or turn some of your online or Instagram friends into real life friends by meeting them in person and giving them a hug. You could want to get a Tan, you could want to sell your book. There are so many different reasons and purposes for attending a conference and I think we often can get overwhelmed by the idea of wanting to accomplish all of them and then feeling like we’re torn, being clear and setting one most important intention for the event for yourself will help you define what success looks like for you for that particular event. There’s no right or wrong here. Your purpose for attending can be different than anyone else’s purpose, but your purpose will help you take different actions depending on what that is. So I’ll give you a couple examples. The first time I went to Alt Summit in 2013 my goal, my main goal was to meet as many people as possible. At that point, I had been blogging for a long time, but I didn’t have a lot of friends who did it as well. So this was my chance to go to Salt Lake and to meet a bunch of people who I had been following or friends with online for years. I hand letter pressed 250 business cards. They were so cute back then. Alt had this big business card thing and it’s not really as much of a thing as it was in the beginning. I turned my business card into a little mini sewing kit, so each business card I hand letter pressed and then I taped a little button, little bit of thread, a little needle, and a little safety pin on each one. At that time, my blog was primarily as sewing tutorial blog and so it went along with my business perfectly and I had stacks and stacks of these business cards handmade to hand out to everyone that I saw and handed them out. I did. By the end of the three day conference, I had exactly zero business cards left. I handed out over 200 business cards throughout that event. I shook hands, I gave hugs. I made the most of meeting everyone at every table that I sat at waiting in lines to go into lunch, waiting outside of conference rooms. I really just looking back, I’m kind of exhausted thinking of myself hustling around, talking to everyone, meeting everyone, shaking hands and giving hugs the entire three days. Did that serve its purpose? Absolutely. I look back and can trace just so many of my friendships to that event. People I met in the hallway that I said hello to and gave a business card too that are now friends. Some of my very best blogging friends, people that I’ve worked with for years. The girl who is now my assistant, Michelle, I met her in the lobby at lunchtime at Alt Summit in 2013 she needed a bandaid. I had a bandaid in my bag. I gave her a business card and a bandaid and fast forward however many years she’s now working for me as my assistant. Those connections were so valuable and so important and it all happened because I had set the intention ahead of time. I am going to meet as many people as possible and I did. Now contrast that with a couple of years later I attended a conference in Orlando, Florida. It was mom two point no, it was the first time I had gone. My friend Janssen from Everyday Reading and I were speaking together, which we do a lot actually. The next couple of conferences we’re speaking together and I was kind of burned out actually, so I had a lot going on in my life. I don’t remember exactly what, but there are lots of things going on and I felt like going to Orlando for this conference was really just going to be a mental break. My mindset was so different than the time that I, the first time I had gone to Alt and I decided that my intention for that week, that I was away from my kids and my family and just focusing on myself and my business was to relax. So I did not hustle around meeting people. I woke up every day and went on a long run around the hotel property in the middle of the day. One day I decided that I was kind of done with listening to speeches and presentations and I went back to the room and change into my swimsuit and I spent the rest of the day sitting by the pool listening to a book. I absorbed the sunshine. I spent time outside. I spent some time napping in the room rather than feeling like I was wasting time and wasting the investment because I wasn’t attending every single session of every single day. I was fulfilling my intention and my purpose for that conference, which was to relax, to breathe, and to spend some time taking care of myself. Did I achieve my purpose for that conference? Absolutely I did. So this first point, my first tip for making the most out of events is to not try to do all of the things, but to set an intention. 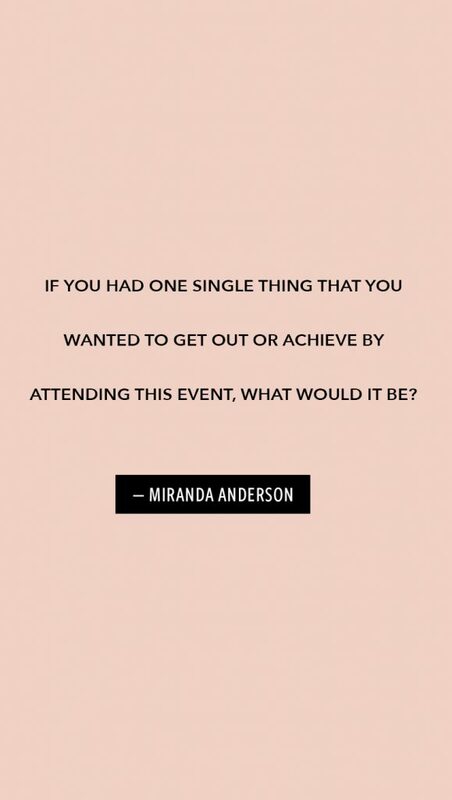 If you had one single thing that you wanted to get out or achieve by attending this event, what would it be? What would success at the end of your three day or five day or one or afternoon event look like to you? Is it that you want to spend some time with yourself? Is it that you want to spend some time with someone else? Is it that you want to meet a sponsor or a business partner and sign a contract? Is it that you just need a little bit of time in the sun? Set an intention and be clear about what that is and you are far more likely to achieve it and feel successful than if you go into the event with no idea of what you want to do or feeling like you want to do all of the things. Okay? Tip Number two, be bold. Once you have your intention set, look for the opportunities to seize the day at the event that you’re at. Do not leave your event with the regret of not talking to that single person or not volunteering for that opportunity. Remember the episode that I gave you about The Advantages Of Optimism and how luck is simply in the eye of the beholder? You are lucky if you think you’re lucky and if you think you’re lucky, you take opportunities because you see them in front of you. I’m going to give you a couple examples of how being bold at events has really helped me feel lucky. So one year, one of the sponsors at Alt Summit was Minted.com. You know the company that does stationary? And, now they have like a whole line of home goods and all sorts of things. So, they had this beautiful display set up at all the sponsors that these events have beautiful display set up and you go walk around and look in. Oftentimes they have swag to hand out and you can chat with the representative there from the brand. And that’s all really fun. And so I did that. I went and saw how beautiful the scenery was and I talked to the woman and we chatted a little bit about some of the new things coming out, fermented and opportunities to work together. And I noticed on the table that there was a big glass bowl full of business cards with a sign that said business card drop giveaway after the conference meant it was going to pull a business card from this glass bottle to send a gift card to. Well as I was chatting I noticed that and on one hand I thought, gosh, I only have a few now. My business cards were not as precious this time. They were just regular mu business cards, which I still have. And love. It was not a handmade or some super special business card that I had on hand at this conference and so I didn’t feel especially stingy about who I was giving them too. I was happy to just toss one in there. I noticed it and I talked to an end where sometime I may have overlooked it or thought, gosh, there’s already a bunch of business cards in there. And that was that. $1,000 to to minted.com because I seized the day and dropped my business card into the business card drop. Raise your hand if you feel like no one ever wins those things. You guys, people win! I won! So be bold and do the thing. Oftentimes with events, there are opportunities that arise to kind of put yourself out there a little further. This is certainly the case with business conferences. One year I saw ahead of time that Alaska Airlines was going to be the sponsor of a live pitch session. So if you don’t know what a pitch session is, basically you create an idea of how you could work with this company. And a live pitch means that you’re standing up on a stage telling the story of how you want to work with the company, what the project or series of posts is going to look like, what the story is that you’re going to spin. It is literally standing, pitching yourself to the marketing team of the company and Alaska Airlines had volunteered, they were a sponsor and they wanted to receive some live pitches. The email said that you needed to submit your pitch ahead of the conference and the only 10 would be chosen for the live session. So rather than just scroll through and think, “Gosh, I have too many things going on or I’m not interested in this”…which is great. If you’re not interested in that and you don’t want to work with Alaska Airlines, then then of course you’d pass it up. But I did. They were a company that I was super interested in working with on some level. I knew Natalie Bowman who was the director of marketing over there and I had been looking for and in a way too formal relationship. So taking advantage of this opportunity seemed like a good idea. I whipped together a pitch and I sent it over. A few weeks later I was notified that I had been chosen as one of the ten live pitch participants. Enter the nerves. When I got to Alt Summit, I was given the day and time of the pitch and I was asked to go first. At the time of the actual pitch session, there were over a hundred people in the room. The front row was lined with about five or six marketing women from Alaska Airlines and I stood up on the stage and gave my ninety-second pitch with a couple of PowerPoint slides about why I was a good fit for working their team. I don’t remember all of the specifics or the details, but I remembered that I thought that it was a really good idea and then I sat down and I watched nine other incredible women share their pitches and I thought they all have really good ideas too. Well, you can probably guess where this is going. I was one of the several winners that were chosen to receive two round trip airline tickets to anywhere that Alaska Airlines flies as well as an opportunity to continue working with them as a sponsor on my blog. None of that would have been possible if I had not been bold and seized the opportunity that was in front of me because of the event. Now, these are really dramatic examples of being bold and taking advantage of opportunities and winning things and maybe yours doesn’t look like that, but maybe the way that your bold is simply to wait in line to talk to that author and have her or him sign the copy of your book that you’ve really, really wanted to have done. Or maybe it’s taking the time to email someone ahead of time and set up a lunch meeting because you know that they’re going to be at the same event and you really have wanted to meet them. My advice to be bold is really about understanding that your opportunities are created by you and if there’s something specific that you hope for that you can go out and make it happen at this event. Tip number three for getting the most out of events is this be yourself. This one can be so tricky because of the pressures, the social pressures, the cultural pressures of being in a large group at something like a blogging conference or design conference or even sometimes like a baby shower. There is some pressure that comes when you’re surrounded by people that you may or may not know and that you feel like there might be some expectation whether or not there really is is beside the point. It’s just that sometimes we make our selves feel like we need to be different in order to fit in and my tip number three is so important that the way to enjoy and make the most out of events is to feel like yourself by being yourself. What this looks like for me is dressing like me. I do not dress in high heels and sparkles and fancy clothes. I wear converse and sneakers and tee shirts and sometimes a hat. The first couple times I went to events, I poured over my outfit choices and my wardrobe and wanted to wear the funky shoes because I know that the photographers at ultimate love to photograph people’s shoes and I thought call, wouldn’t that be cool if I had really cool shoes that could be photographed? No, I don’t have cool shoes. I have tennis shoes and I have sandals. It’s fine if my shoes are not photographed, if I feel comfortable wearing them. Be Yourself. Dress comfortably in the clothes that you like to wear. Eat normally. Sometimes at events the food gets a little bit crazy. There can be fancy food, fancy orders, fancy kind of appetizers or there can just be like an over abundance of food. A lot of times eating other people’s foods are foods that are not normal to us. Doesn’t make us feel good after a couple of days it can be really fun for a little while to like not have to cook and not be worrying about what we have to eat. Having that provided for us. I also find that when I don’t eat semi normally or what feels like normal to me that I start to not feel very well. So even if you’re at a breakfast buffet that has 500 different choices, if you normally like to have a slice of toast and maybe some fruit for breakfast, don’t feel like you’re missing out on the opportunity to indulge in a million different types of foods if you might just feel better eating the things that you normally eat. For me, that often looks like bringing a couple of snacks, having breakfast, I like to do kind of a simple light breakfast and so I like to keep that in my room or making sure that I get plenty of fresh fruits and vegetables because I start to feel really sick after a few days if I haven’t been eating semi normally. So just take that into account. You may take the event as an opportunity to just go way off the rails and eat all the random stuff and that’s fine too. Just know that you might feel better if you make sure you stay true to yourself. And the types of foods that make you feel good and fuel your body because you want to feel good so that you can have a great time at this event. Another tip that I have for being yourself is to exercise. If that’s something that you normally do, a lot of people take a little break from exercise when they’re on vacation or at an event. That’s fine if you want to, but also know that it’s okay to take the time to maybe miss the breakfast or maybe missed the first session. If you really want to get your run in or you want to go to a session of yoga or you want to go on a hike, that’s okay. You can do that and feel like yourself because you’re staying true to your schedule. And the final point that I want to make in being yourself is to just take a minute before you go, and this goes along with the first two that I talked about. Two of setting an intention, being bold about creating opportunities that are right for you. Recognize that what is right for you and who you are is different than everyone else. A lot of times our society and culture glorifies one particular type of personality. That personality is the the one in the spotlight. It’s the loudest one in the room. It’s the person with all the ideas. It’s the hustler, it’s the busy body and it’s okay and wonderful if that is not you. You don’t need to push yourself outside of your comfort zone into being someone different than you are. If you prefer to have a long conversation with one or two people rather than be in the middle handshaking and hugging like I did at my first conference, you’re going to have a much better experience. You won’t be exhausted, you won’t feel overwhelmed and best of all, you’ll feel like the connections you make are true because you’re being true to yourself. So be yourself. That’s the probably the very best piece of advice that I can give you for making the most out of your events. Be Yourself and you’ll get to enjoy everything from your wonderful unique point of view. And my fourth and final tip for making the most out of events is this: be present. It can be really easy to feel overwhelmed, but all of the different things that are happening to feel like you’re missing out on one thing because there’s something else going on, especially at conferences where there are multiple tracks and there’s multiple classes going on. There’s also sponsors. There’s also dinners, there’s also parties. There’s so many things happening. I have been stuck sometimes at conferences feeling like I’m missing out on everything because I’m sitting in one class and not going to any of the other ones. It’s really important to recognize that you can only be in one place and that that place that you’re in is exactly where you should be. Feel it, absorb it, be present, be mindful. I want to share an example. One of the years that I was at Alt Summit, there were three different rooms, each with a keynote speaker or a panel happening at the same time for each block of the day. I had a schedule and I had circled ahead of time, all of the different sessions that I wanted to go to and most of them were kind of hustle sessions. It was how to grow on Instagram and how to get more page views and surefire tips for mastering Twitter. These were all of the classes that I, that I wanted to go to. It’s so funny to think back on that because those are definitely not the classes that I would be choosing these days, but those were the things that I really, really wanted to learn right then. And I remember I was hustling down the hallway to get to one of the classes. This I remember specifically was a Twitter class. If it was surefire ways to win at Twitter and I got confused on the rooms. It was room A, B, and C and I was supposed to be headed to room c and I accidentally went to room a and I got in and I settled down and I opened up my notebook and I was ready to take notes and I got a good seat and the presentation started and within a few minutes I realized I was not in a Twitter class. I was in a class called living your own story with Karen Walrond. For a minute I froze and thought, how am I going to get out of this room? This is fluffy. I don’t need to know about my own story. What I need to know is how to build and be a master at Twitter. That’s what I need to know. So I sat there feeling a little bit frenzied in my head, but I had chosen this great spot close to the front of the room. I was all set up. I had my water, I had my pen. I was like ready to go. Then I thought, I cannot get out of this. I am going to have to sit here through this hour session of learning about this fluffy, how to live my own story instead of learning how to master Twitter. I’m just resigned to that. After a few minutes I kind of settled down and I settled in and I started paying attention. Even though I felt like I was missing out on Twitter, I realized I’m going to just have to be here and be here now. I am so incredibly grateful for the mistake that I made to go to that class that day. Karen Walrond is an incredible speaker and she guided us through these practices and some questions and really just it was the most inspirational talk about why we matter as individuals and how experimentation helps us choose what we love and that it’s okay to write our story as we go along. We don’t have to have the ending all figured out and one of the things, the practices that she shared is something that I have used over and over and over in my life and in my work, which is to close your eyes and to imagine the last time that you were brilliantly happy. What did it look like, and then to ask yourself, how often is that type of experience part of your regular life? If it’s not often part of your regular life, then maybe you can shift some things so that it is because you deserve to have that kind of brilliant, wonderful, sold, bursting happiness regularly in your everyday life. I can guarantee 1000% that if I had been to How To Master The Art Of Twitter that day, that I would not have learned a life changing lesson. Because I simply resigned– whether it was a mistake or not is beside the point– I resigned to being present where I was to learning all that I could and making the most of the session that I found myself in. Forgetting about all of the other sessions happening. All of the sponsors that I wasn’t visiting right then all of the people that I wasn’t meeting at that very moment, I stayed present where I was and I had the most incredible experience. Another example of being present is kind of opposite. One day at a conference I was wandering down the hallway and stopped to look at an art installation and another girl happened to be standing next to me looking at as well. The sessions were about to begin, people who were hustling back to whatever classroom they had chosen and I decided to say hello to this girl and so we ended up chatting and really connecting and enjoying the art together, but also just learning about each other and we became friends and we missed the sessions. We didn’t go to any of the sessions. I don’t even remember what they were or what I had been planning on going to, but I made this connection to a girl who I have now been friends with for years and every time I’m in San Francisco I give her a call and we try to meet up and we are, we’re not best friends, we don’t hang out every day, but it was a valuable interaction and a person that I’ve really enjoyed connecting with and being friends with throughout the years. Maybe what you need during one afternoon of your event is to go sit by the pool. Maybe what you need is the session about how to build an empire and take over the world. Maybe what you need is to take advantage of the opportunity to spend a few minutes making something in the art lab or the hands on makerspace. 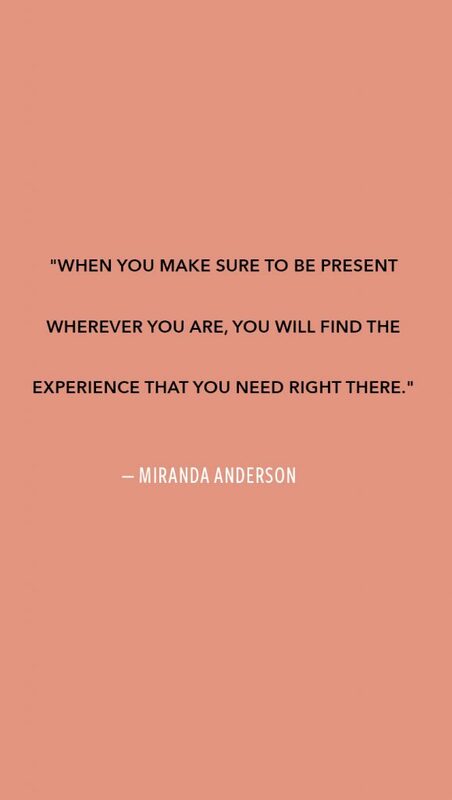 When you stay present, you make where you are the right place to be. Let me go back and review for you quickly the four tips that I shared it for making the most out of your events. Number one, Be Clear. Set an intention. Decide what success looks like ahead of time so that you can make it happen. Number two, Be Bold. Create the opportunity that you need. Number three, Be Yourself. Don’t try to dress or eat or exercise or act like someone that you’re not. Recognize that who you are is just enough. You’re who you need to be. Number four, Be Present. There may in fact be a hundred things that you miss, but the thing that is right in front of you is the one that you need the most. If you’re going to be at Alt Summit coming up next week, please find me and say hello. I’m teaching an indigo workshop on Monday. I’m going to be coaching with Alison’s brand school on Tuesday. I’m teaching a class about win, win, win partnerships with Janssen Bradshaw of everydayreading.com on Wednesday. I will be sitting by the pool on Thursday. Make sure you come give me a hug. I would love to meet you. Spring Indigo Dyeing Workshops are LIVE! And speaking of events, I need to tell you that my spring indigo dyeing Shibori workshops are available now. Okay, my lovelies. That is it for today. I hope that you’ve found something in this episode helpful and applicable to your everyday life. Even if you’re not attending a blogging conference anytime soon. These tips can be used for any event that’s happening in your own life right now. As always, I want to thank you from the bottom of my heart for listening, for tuning in, for subscribing and being a part of this community. If you enjoyed this episode or any of the other episodes that I shared, please pass on the favor and share it with someone else. Tell your friend, tell your sister, send an email, post it on Facebook, take a screenshot and put it on Instagram stories. Also, if you’re enjoying the show, I am going to invite you again like I do every week to take two minutes and head to iTunes and leave an actual review of the show podcast live and die by their reviews. That’s one of the measures that apple uses to tell whether or not the show is important enough to share it with more people, to put it up in the rankings and to get it out there. I would love for as many people as possible to be able to hear these messages and be inspired to live a more creative, adventurous, and intentional lifestyle. And so if you have a couple minutes and you’ve enjoyed and something that I’ve shared it today or any other day, please take a moment and share with you. And you know, every couple of weeks we choose one and we send you a thank you review package so you can look forward to that as well. Have an incredible day, an incredible week. And I will talk to you next time. See you later.